Here is my potential list of reads for this summer. It is long, but I am an optimist. And these titles cover a range of topics. Diversity is the key here. I will be focusing on thinking in all of my teaching next year and I have heard great things about Making Thinking Visible. Next up, Notice & Note. I absolutely love annotation strategies that help students dive more deeply into texts. But there are always some students I don’t seem to reach, and they continue to struggle to create meaning with the text. Notice & Note promises to support that during reading stage for grades 4 to 12 students, and of course, Kylene Beers’ reputation in her previous work on reading precedes her. Harvey and Daniel’s Comprehension and Collaboration is a must read for anyone thinking about student inquiry. I am intrigued by the maker space movement that is emerging across the globe. I belong to a family of makers (long before it was chic). We build, bake, grow, construct, assemble, sew, and create , and I have in the past brought my predilection for making into my classroom. I am looking forward to adding to my repertoire with Invent to Learn. This book has been on my TBR list since in came out last spring. I have been inspired by November’s videos and his latest book will, I am sure, support my thinking about learning in the modern world. I teach adolescents, many who struggle with the learning process. How can I resist giving Turnaround Tools for the Teenage Brain a go? Love Dan Pink’s interdisciplinary approach to life. I know he is a business writer by trade, but his ideas do crossover to education and our personal lives. As my children are growing up and moving away, I have looked for ways to keep us involved in each other’s lives. Having a family book club is one thing that we do. To Sell is Human might be next on our list. I know educators are reading it, and I am hopeful that it will also appeal to the mechanic, the solider, the dancer, and the musician in the family. These two books by Peter H. Johnston are on my list every summer as re-reads. Changing the way we speak to our kids and each other, and re-configuring our approach to learning takes time and it takes support. Each summer I take some time to reflect on Johnston’s words and on how I am faring. Literacy is a big conversation. As a literacy coach, you’d think I’d be comfortable in it, but that isn’t necessarily the case. For starters, you won’t hear much about the complexity of literacy in the work I do with teachers. The truth is that it is tough to get people to move beyond the fundamentals of reading and writing. I say ‘people’ (meaning adults) because it isn’t just teachers who need to take their heads out of the sand. From senior administrators to parents, some learning about what literacy was and is morphing into must happen. How does the traditional view of literacy fit into the modern classroom? What does it look like? How is it assessed? As we move to modernize our systems and try to figure out how to use the tools of the transformative learning environment, educators will struggle with all of the explanations and taxonomies presented. This post represents my current thinking on how I can support teachers in their understanding of the transformation from the traditional literacy perspective (reading and writing) to digital literacies as Doug Belshaw envisions them. How to begin? With backward design, of course. We start where we want to be and plan backwards to where we are. Let’s start with some definitions of literacy. Then we can have a look at Doug’s thinking about digital literacies. A subset of digital literacy is web literacy, so we can look at that next because it may provide us with a way to get to digital literacies. And then, I think Silvia Tolisano’s work combining the SAMR model with Alan November’s thinking provides another entry point to digital literacies along side the web literacy standard. The ability to understand and employ printed information in daily activities at home, at work and in the community – to achieve one’s goals, and to develop one’s knowledge and potential.” (*Literacy Skills for the Knowledge Society: Further Results from the International Adult Literacy Survey*, Organization for Economic Co-operation and Development, Human Resources Development Canada and the Minister responsible for Statistics Canada, 1997). experiences in order to develop new knowledge and deeper understanding. It connects individuals and communities, and is an essential tool for personal growth and active participation in a democratic society. The last definition moves into more complex territory. Now we have to think critically, share, interact, and connect not just so we may communicate clearly, but because literacy “is an essential tool for personal growth and active participation in a democratic society.” But this definition reflects 2004, a time pre-iPhones, and iPads, pre-Facebook and Youtube. Can these definitions support the way we can now interact in the world? In what ways does our idea of literacy have to shift? Great. 8 ways to think about digital literacy. How to do this? 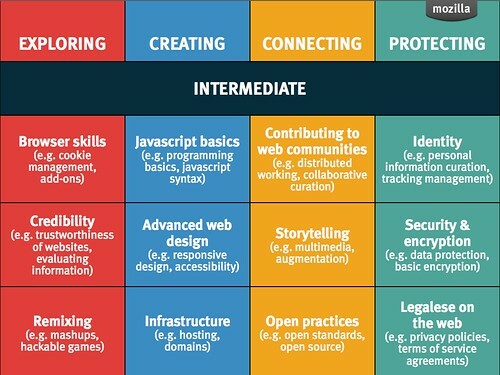 One way may be to use the grid below from the Mozilla Web Literacies project. Maybe before we can dig into digital literacies, we need to move past being only consumers of the web to makers of the web. If I am exploring, creating, connecting, and protecting on the web, then I have a much better understanding of Doug’s idea of how “Confident” is an element of digital literacy. Silvia Tolisana has created a way for teachers to think about how to integrate technology in order to create the transformative learning environment that will support the work represented by the above web literacies grid. 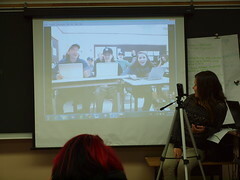 Here too, if I can move my practice from Substitution to Redefinition, from printing out digital content to participating in collaborative wikis, then I am more likely to realize how “Constructive” is an element of digital literacies. We need to be able to move from theory to practice. What are your thoughts and / or ideas about supporting teachers and students as they begin to learn how to be digitally literate?